As David Tennant takes up residence in the Tardis, he's discovering the benefits of playing the 10th Doctor Who - loads of adoring fans and, best of all, his very own Time Lord doll! The role of the Doctor is the most coveted on British television, but David Tennant is surprisingly unfazed by his incumbency as the 10th Time Lord. The Scots-born actor, who came to prominence a couple of years ago after garnering plaudits for roles in Blackpool and Casanova (the latter by Doctor Who writer Russell T Davies), is a mixture of boyish enthusiasm and level-headed candour when talking about the whole crazy experience. 'There is a sense of everyone waiting for you to fall on your face. After all, the show gets coverage like nothing I've ever done before and probably never will again,' explains the 35-year-old actor. And despite the fact that the stakes are high, Tennant is clearly having a ball. Not least because he and co-star Billie Piper get on so famously. Of course, the Doctor and Rose's romantic frisson is set to continue in this second series, although Tennant is guarded about giving too much away. The first episode of the new series sees the Doctor take Rose to mankind's new Earth in the year 5000000023. There they visit a luxury hospital run by cat people. On the surface it seems to be super efficient, but within these walls lies a gruesome secret. And to make matters even more dangerous, the Doctor's old foe Cassandra (Zoe Wanamaker) has resurfaced. And she's out for revenge. Filming these antics proved very exciting for Tennant, although nothing compared to the thrill he got when the toy figures of his Doctor were unveiled. With the help of these small plastic figures, Tennant's profile is guaranteed to grow and grow. But the devotion of the show's many fans is in no way an annoyance. On the contrary, he finds it quite humbling. Lip-lock Doc: What's going on between him and Rose? Feline groovy: But can the Cat People be trusted? In School Reunion, Seventies companion Sarah Jane Smith (played by Elisabeth Sladen) makes a surprise return, and it's handbags at dawn when Rose gets to hear of her history with the doctor. Plus, Sarah Jane's famous four-legged friend, K9 (bottom), puts in an appearance. Some svelte-looking Cybermen (left) return to the series after an 18-year absence in The Rise Of The Cybermen and will be a presence throughout the series. The Doctor's second-biggest foes (after the Daleks) have invaded an alternative Earth that's heading for disaster. In Tooth and Claw, Queen Victoria's (Pauline Collins) lonely widowhood is spiced up by a visit from a very aggressive werewolf. And in The Girl In The Fireplace, the Doctor and Rose travel to the court of Louis XV, where they meet courtesan Madame de Pompadour (Sophia Myles). In The Idiot's Lantern (written by The League Of Gentlemen's Mark Gatiss, a long-standing Doctor Who fan), a drab, post-war Britain comes under attack by an alien life force. Most chilling of all is that they travel through TV airwaves! APA 6th ed. : (2006-04-15). 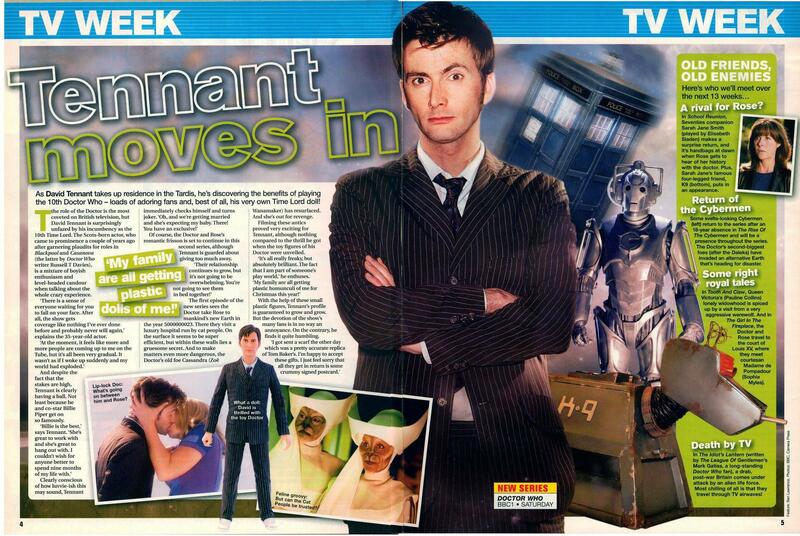 Tennant moves in. Total TV Guide p. 4. MLA 7th ed. : "Tennant moves in." Total TV Guide [add city] 2006-04-15, 4. Print. Turabian: "Tennant moves in." Total TV Guide, 2006-04-15, section, 4 edition. This page was last modified on 7 September 2016, at 16:59.